In the midst of the psychotic CVS lady from the other day, I did manage to have a successful nail polish trip. They had Revlon products BOGO 50% off and I spotted the new Revlon glitters so I decided to get them all. I'm glad I spotted them because they were hidden in the deep dark corner on the bottom shelf. I hope no one was hiding them :P.
This collection came with 4 creme colors Galaxy (black creme), Ruby (red creme), Silver (grey creme), and Rock (purple creme). All of these creme shades came with sparkly glitter top coats as their counterparts. Each of these top coats corresponded to the creme color. I only purchased the glitters, since the cremes were pretty standard colors I already had in my collection. This is Galaxy layered of Wet n' Wild Black Creme. Galaxy is prominently a mix of black glitter mixed in with blue, gold, and silver glitter and, silver holographic hexagonal glitters all suspended in a clear base. I really love the variation of the colors with the glitter in this one. This is Belle layered over Milani Day Dreaming. Belle is prominently a silver glitter mixed in with gold, blue, and silver holographic hexagonal glitters suspended in a clear base. This is not a look I would ever think to go for but I quite like it! This is Star layered over OPI Funky Dunkey. 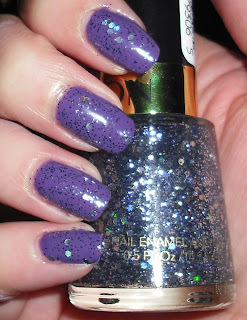 Star is a purple and silver glitter mixed in with silver holographic hexagonal glitter suspended in a clear base. Here are all the glitters layered over black. Index to Pinky- Galaxy, Star, Slipper, & Belle. Overall, I really enjoyed these glitters. I have read a lot of comments from people on whether they should get these or not. I don't think these are must haves, but for me I'm glad I bought them. I first was unsure because they didn't seem to have much variation between the glitters, but at a closer glance these all have their own unique blend of different color glitters. Also, you don't have to go by Revlon's guidelines obviously you can layer these over any color and you'll get different results. If you're into glitters and layering a lot then I think these would be right for you. I personally like having all of them. 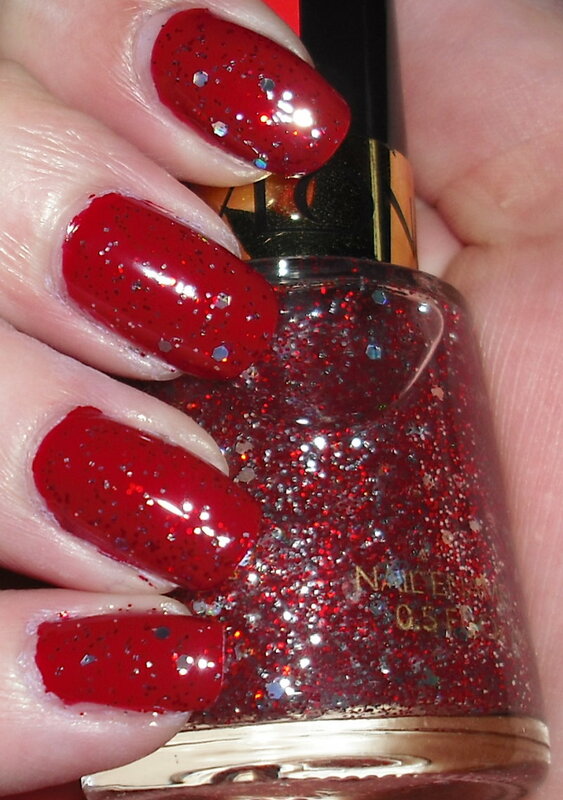 I like the addition of the hexagonal glitter that isn't very common in drugstore polishes. I think if you're on the fence, getting one of these will probably do the job. If I had to pick a favorite I'd go with either Galaxy or Belle because they have the most dimension and would probably be the most universal as far as you could layer it over anything. Galaxy and Rock are similar but Galaxy is better. I personally love Slipper because I love red glitters, but if you're not into red much this one wouldn't be necessary. Again, I don't these are must haves, but they're nice additions. I think it just comes down to your personal tastes and what you like to do with your polish. I hope this review gives some insight and helps some of you out rather than left you dumbfounded! 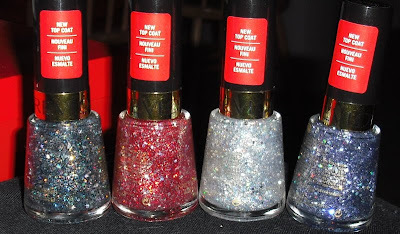 Now if we can only get Revlon to bring back Street Wear polishes! I saw these on Saturday and looked at them and *wished* I liked sparkles/glitter better than I do. I HATE taking it off cuz it ends up everywhere. I like it a lot on other people tho, lol. So I'm glad I got to see these. Hmmm...I'm going to CVS today after work. I might just have to scope these out. Thanks for the review! I'm missing Belle Which CVS did you find them? Belle over the grey is good. BYS do cheap glitters with BIG hex in them. Available in the UK and Oz. so. so. so. so. so. so. jealous. enter my giveaway! Steph's in it and you should be too!! ps. she's the best. and i'm still jealous. Oh wow, these glitter coats look really great on you! I'm not sure if they're for me though, but if I had to pick a favorite, it'd be Galaxy! @Lacquer- It's true they can be a bit messy to remove. I'm glad you liked the swatches! @rmcandlelight- Thank you! I saw these at the CVS on Dr. Phillips Blvd & Conroy-Windermere. I also saw them at the Walgreens in the Publix shopping center at Conroy & Kirkman. @1xellus1- Yes, they are quite a sight to see, so sparkly and pretty. Thank you! @jaljen-I love it over the grey. I never would of thought glitter would look so great over it. Thanks for the tip on BYS. @Mimi-Galaxy is definitely the winner in the collection. 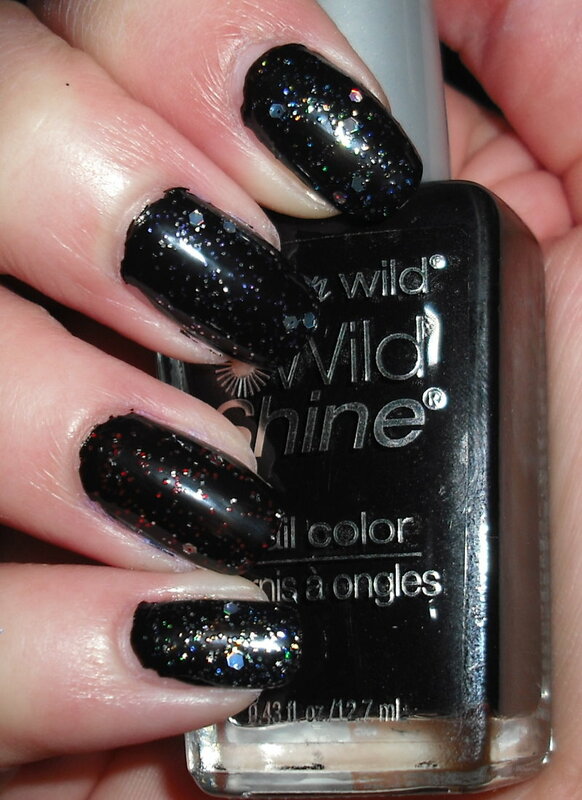 It's interesting to see a polish with black glitter in it! @necessary-Thanks! If you can't find them at CVS I also saw them at Walgreens. I want to pick up Galaxy...there's something so chic to me about black glitter. I havent seen these in Montreal yet! I think that they are a good alternative to the new Deborah Lippmans!! !